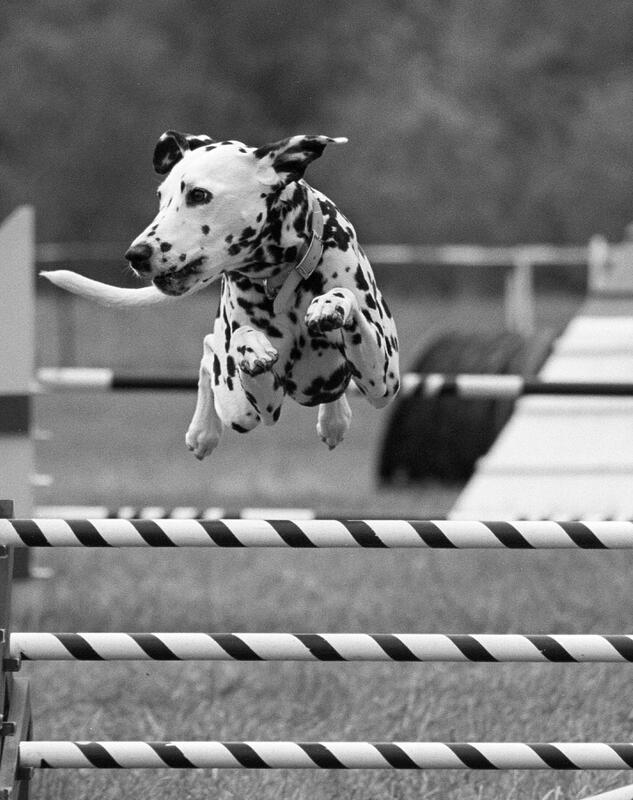 Dalmatians make excellent agility competitors. Photo copyright Christine McHenry. For those who are active and enjoy time outdoors, the Dalmatian is definitely worth taking a look at. Historically bred as a carriage or coach dog, the Dalmatian can easily cover twenty to twenty-five miles at a strong trot, making them the perfect companion for joggers, hikers, bikers and trail riders. As they also protected the carriage and horses from strange dogs and potential robbers, they are quite capable of keeping their owner safe during their outings and at home. A medium-sized dog, the Dalmatian is between 19 – 23 inches at the shoulders and weighs 40-65 pounds. Their build suggests great agility and stamina, being moderately built. They excel in popular dog sports such as agility, obedience, rally and flyball, and one can frequently see them competing with their owners in these sports.They also do well in tracking and the new sport of nose work. One activity that few people would place a Dalmatian at is hunting. As there is historical evidence that Dalmatians may have been used in the hunt field and may be related to the Pointer, a few of them have obtained their titles with the North American Hunting Retriever Association. 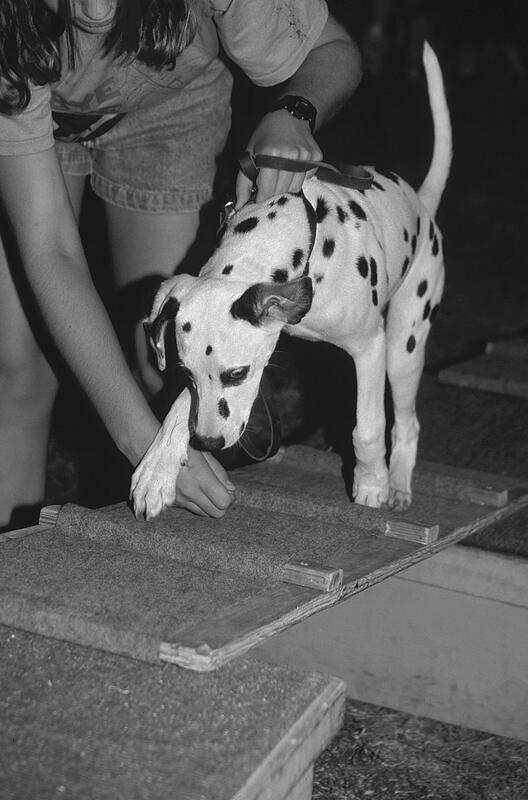 Road trials are a competition which were developed specifically for the Dalmatian. As an historic coach dog, the road trials allow fanciers and breeders of the Dalmatian to continue this aspect of their dogs. Road trials have both an endurance section, either 12.5 miles or 25 miles, and an obedience section. The handler may be horseback or in a cart or carriage. Dalmatian owners who either have access to or own horses can enjoy this sport and show off their dog, as well as know that when they are out riding or driving, their faithful companion will not only be able to be with them, but they can feel a part of history as well. This puppy is learning basic agility skills at a puppy kindergarten class. Photo copyright Rosemary Shelton with Click the Photo Connection. All of these activities suggest the Dalmatian has a good temperament and enjoy being with their people. They have a reputation of being the class clown, and are independent thinkers, but are extremely intelligent and do like to please their owners. While they are naturally protective, they are not normally aggressive. As with all dogs, it is best to socialize the Dalmatian puppy and enroll him, if possible, in a puppy kindergarten class, followed by a basic obedience class. They thrive on motivational training methods that use treats, praise, toys and petting for rewards. With anything more regimented, their independent side causes them to rebel. Around the house, the well exercised Dalmatian will fit right at home. While they do not do as well as an apartment dog, if the owner is very active and can provide several daily long walks, outdoor play and mental stimulation, they will do fine. They are highly sociable dogs and prefer to be with their people, so do not do well as outside dogs. If they do not receive enough attention and exercise, they, like all dogs, will develop bad habits such as barking or digging. A good-sized, securely fenced yard is recommended for them to be able to run and play or lounge in the sun. While they do have short hair and do not shed as profusely as the thicker coated breeds, they do shed small amounts throughout the year. Regular brushing with a hound glove or soft brush will not only keep the shedding minimal, but will also help to keep the coat shiny and clean. Otherwise, the well-bred Dalmatian is a very easy keeper, with little demands in regards to care. While the average Dalmatian has little health concerns, there are some health issues that are more prevalent in the Dalmatian then in other breeds. Deafness is one issue that all Dalmatian owners should be aware of. While research has shown that Dalmatians are not born deaf, they may inherit a degeneration condition which may begin as early as one day after birth or may not present itself until the dog is older. Puppies that have one parent that is unilaterally deaf is more likely to be deaf than a pup with two bilateral hearing parents. 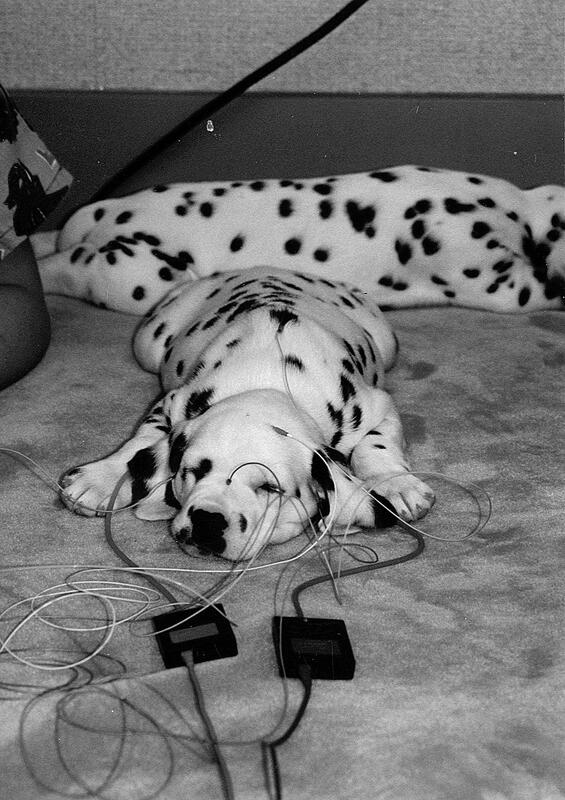 All Dalmatians should have their hearing tested through BAER (Brainstem Auditory Evoked Response) Another health issue, unique to Dalmatians, is urinary stone formation, or urolithiasis. This condition can be maintained with diets that are low in purines and adequate water provided at all times. If you are intrigued by the Dalmatian, check out Kathy McCoubry’s book, All About Dalmatians.This book covers the mystery of the history of the Dalmatian, as well as choosing the right dog, health, training, the breed standard and other information. This entry was posted in Breeds of Dogs, Dalmatian and tagged about the Dalmatian, Dalmatian, Dalmatian dog, dogs. Bookmark the permalink.